North Shore Music Theatre Cuts Loose With"Footloose"
Beverly's North Shore Music Theatre continues its 2011 season with the high-energy dance musical, "Footloose," playing August 16 - 28. "Footloose" is produced in association with The Cape Playhouse in Dennis. The production will be directed by Mark Martino (NSMT’s “Dirty Rotten Scoundrels,“ “A Chorus Line“), with choreography by Vince Pesce. Inspired by the wildly popular 1984 movie of the same name, "Footloose" thrilled Broadway audiences for nearly two years. It’s the story of American spirit -- a carefree city kid transplanted to a conservative rural town where rock ’n roll and dancing are forbidden. He takes on the authorities, makes all the right moves and wins the girl as well. The stage adaptation by Dean Pitchford and Walter Bobbie, based on the original screenplay by Dean Pitchford, features all the chart-topping music from the film (“Almost Paradise,” “Holding Out For A Hero,” Let’s Hear It For The Boy,”) mixed with new material written specifically for the stage. The score contains music and lyrics by Tom Snow and Dean Pitchford, with additional music by Eric Carmen, Sammy Hagar, Kenny Loggins and Jim Steinman. 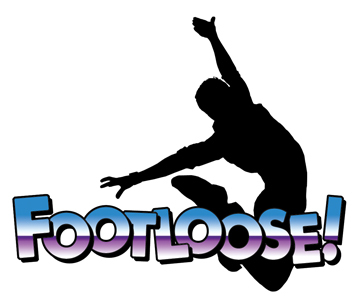 The cast of "Footloose" will be led by John Jeffrey Martin (Broadway’s “Hairspray,“ “Rocky Horror Show“ and “Good Vibrations“) as Ren McCormack with Chelsea Morgan Stock (Broadway’s “The Little Mermaid“ and “Baby Its You!“) as Ariel Moore. Also featured will be long time NSMT favorite George Dvorsky as Reverend Shaw Moore, along with Maureen Brennan, Marci Reid, Stephen Berger, Matthew Dorsey, Gwen Hollander, Gary Lynch, Marissa Rosen and Sean Watkins. For tickets and information, stop by the box office at 62 Dunham Road, call 978-232-7200 or visit www.nsmt.org.